Unfortunately, I’ve come down with another cold/flu. I’m trying my best to kick this one fast so that I can get back to work and doing things besides watching Netflix in my pajamas all day (not that I haven’t enjoyed that!). To get some fluids and nutrients into my system, I whipped up this cold-busting green smoothie with a healthy dose of turmeric. Turmeric is super anti-inflammatory, which is just what your body needs when it’s fighting off a cold. Not only should you eat it when you’re sick, but it should be something you include in your diet all the time because it’s great for the brain, the heart, preventing cancer, and does plenty of other amazing things for your body. Smoothies are a great way to introduce turmeric into your diet because it tastes fairly mild when blended with fruits. I used a teaspoon in this recipe and you can taste it slightly, but it isn’t too overpowering. You could reduce the amount to 1/2 a teaspoon if you are still adjusting to the taste. As for the rest of the ingredients in this cold-busting smoothie, I used pineapple because it is loaded with certain enzymes that can help relieve congestion and flush toxins out of the system. I used coconut water as the liquid in this smoothie for an extra dose of electrolytes, since electrolytes can easily be lost when you’re sick. Bananas can also be good for replenishing electrolytes, and are easy to digest. And of course, I included spinach for a hit of vitamins that the body is craving to revive your immune system. Blend until smooth, adding more or less coconut water to achieve desired consistency. I topped my smoothie with an extra dash of turmeric and a sprinkle of chia seeds. 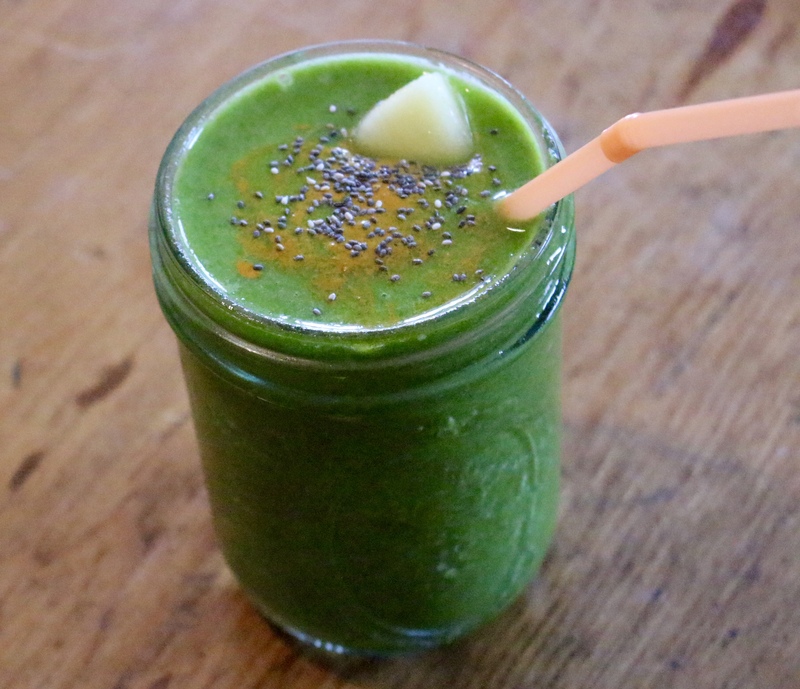 Bookmark this turmeric green smoothie recipe for next time you are feeling a bit run down or under the weather to give your body everything it needs to fight off any colds or flus that may be going around this winter! It may be tempting to use the excuse of being sick to eat take-out and sugary baked goods that don’t require any effort, but it’s really important to give your body nutrients and avoid sugar as much as possible when you’re trying to fight something off. It will help you get better that much faster. With that said, I hope you stay healthy this winter!